Back in March, Dropbox acquired the popular Gmail email app Mailbox and last month the latter updated its iOS app to allow sending attachments from the former. 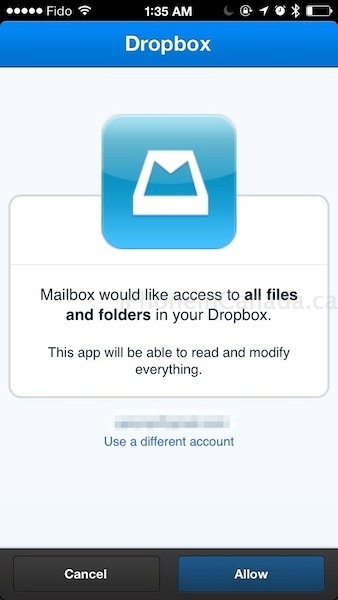 Dropbox now offers users 1GB of free extra storage space by linking your account to Mailbox. It’s the easiest and fastest way to earn extra storage, in seconds. Here’s how to do it. 1. Launch Mailbox. Go to Settings > Dropbox > Add Dropbox Account then link your account. If you already have Dropbox for iOS installed it’s dead easy. Normally, referring friends to Dropbox will earn you 500MB for each successful sign up. Linking your Mailbox to Dropbox is by far the fastest and easiest way to earn free storage. Even if you delete Mailbox, the free storage will stay in your account. Update: If you previously linked your Dropbox account before this offer, you won’t get the extra space. Unlink then re-link your account to get your 1GB (via @ssklassen19).